IECEP Manila 2013 Officers Oath Taking. This was my first ever service as an officer of our professional organization; I was elected as the Corporate Secretary then. 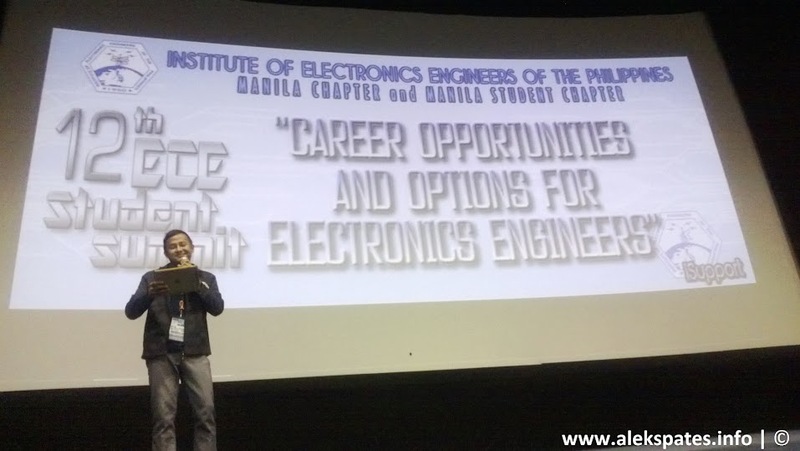 A few months after I got my Electronics Engineer license wayback 2008, I began involving myself as an active member of our Professional Organization, the Institute of Electronics Engineers of the Philippines (IECEP, Inc.). IECEP Manila 2013 1st Board Meeting. As an observer, I got disappointed on how poorly it operates during that time. However, because of the said dismay and frustrations, it didn‘t become a reason for me to abandon or to be indifferent with them and instead I engaged myself more by participating in their activities not only in the seminars but also in the other projects like outreach or fun run. My 1st Electronics Engineering Quiz Show Judging last 2013 held at Lyceum of the Philippines University. Of course, I have paid all expenses from my own pocket, and nope, I’m not a high wage earner but only an average one. I was just really finding ways, and saving money to attend to it. The Plaque of Appreciation I received during the 1st Electronics Engineering Quiz Show Judging 2013. While participating in their projects and activities, every time I was seeing lapses, substandard and unacceptable practices, I was always calling the attention of the past board members and officers and ranting what I saw, straight to their faces. IECEP Manila 2013 1st Best Local Chapter Award. Thus, I know for sure that it always left them with a guilt feeling. I continued the said strategy as my way of supporting our professional organization. Teamwork. Professionalism. Hardwork. It is such a milestone for me that I was part of IECEP Manila’s 1st Best Local Chapter Award 2013. Five years later (2013), I became more involved to the organization when I’ve had the opportunity to serve as one of the officers of IECEP Manila Chapter (thanks to my former undergraduate professor, Engr. Ronnie Serfa Juan who dipped me to this mess ~ just kidding!??). IECEP Manila 2013 Incumbent and Past Officers and Students. Looking back on my six years of tenure in the Institute of Electronics Engineers of the Philippines-Manila Chapter (IECEP Manila, Inc.), and now that I’m part of the 10th Anniversary celebration last January 11 and 12, 2019 held at the Century Park Hotel Manila, I‘m grateful that God has given me this blessing to publicly serve my fellow professionals. It doesn‘t just keep my feet on the ground but it also helps me to realize that earning money or building your career way up for your own good alone is nothing, if you don‘t know how to share your time, effort, and resources to those who are in need. IECEP Manila 2019 Summit and 10th Anniversary Celebration Programme. Posing during the 2nd day of the IECEP Manila 2019 Summit and 10th Anniversary Celebration. IECEP Manila 2019 Summit and 10th Anniversary: Some of the Pioneers and Incumbent Officers. Attendees of the two-day IECEP Manila 2019 Summit and 10th Anniversary held at the Century Park Hotel Manila, January 11 and 12, 2019. IECEP Manila 2019 Summit and 10th Anniversary: Incumbent Officers. IECEP Manila 2019 Summit and 10th Anniversary: Past and Incumbent Officers. IECEP Manila 2019 Summit and 10th Anniversary: Past and Incumbent Governors. Blogging nowadays, is a common thing for millennials. As long as you have the passion, the gadget (cellphone, tablet, or computer), and of course, the time to write your article, you can definitely be an instant blogger. Because of the power of internet, the vast exchange of information from one part of the world to another is a not roadblock anymore but it introduces a different form of concern: diminishing the thin barrier between different professions related to writing: the blogger, and the journalist. Both of it (blogging, and mass media) pertains to the sharing of information whether fictional (literature) or factual (documentaries or straight information), and it is the indeed the responsibility of the writer (blogger or journalist) to relay the information in an ethical manner. Fake news is a BIG NO! NO! However, if the said article just relays the information straight to the readers with no intention, purpose or persuasive action, then that information might just be useless because it just entertain, and it doesn’t interact with its readers. The people of the world need not just passionate bloggers, but passionate/ethical bloggers who will help our country to broadcast not just the writer’s personal interests but also the solution to the different socio-political or economic issues that our country is facing. You might think that a simple blog article is not as powerful as resolving the crimes (corruption, drugs, human trafficking, etc.). You are probably wrong because one must not estimate the true power of writing. As long as the article could influence, and empower its readers to create a change or to put into action the suggested resolutions which have been discussed in the said article, then its power and ability to withstand a problem is greater than just a single cop killing a suspected drug addict on the street. Why would I want to be a #BlogOPPOlis Creator Scholar? My answer is just simple, I want to be a writer with an ethical purpose. They say that the passion of true writing is easier said than done, and that is what I want to prove. However, the idea can be changed because I believe that Blogging is more than just a passion since it must serve its purpose. 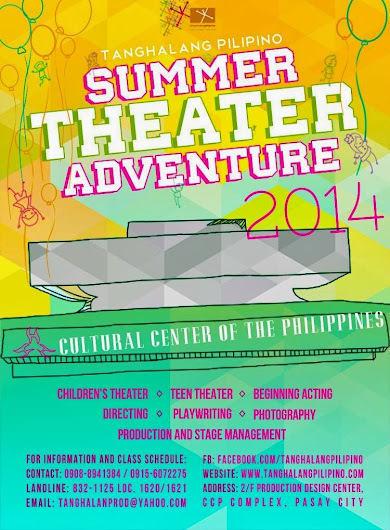 DULAANG LA SALLE ARANETA ENSEMBLE (DLSAE) is the official theatre company of De La Salle Araneta University. It was established last 1995, and it was founded by Christian D. Pelayo, Ph., an alumnus of the Basic Education Department. The original name of DLSAE is TANGHALANG ARANETA ENSEMBLE, and the very 1st Theatre Season Production (1995-1996) is a back-to-back stageplays of BATAS NG KALIKASAN, and SA NGALAN NG AMA, held at Rizal Hall. It was a great challenge for Mr. Pelayo to retain the theatre company since he was still finishing his Bachelor’s Degree in Pharmacy during that time. After the success of this production, it was preceded by several productions and competitions in and out of the campus. However, the same kind of production was never repeated after the 1st Theatre Season. TANGHALANG ARANETA ENSEMBLE stopped for three consecutive years. Year 1999 was the rebirth of TANGHALANG ARANETA ENSEMBLE, and the name was changed to DULAANG ARANETA ENSEMBLE (DAE). Mr. Pelayo’s come back was another great success when the 1st Theatre Season Production (1999-2000) under the new name was materialized. This composed of the back-to-back stageplays, AMBON NG KRISTAL, and MOSES, MOSES, and it was held at Rizal Hall. After this production, DAE conducted several performances in and out of the campus, and the 2nd Theatre Season Production for the play ANG SISTEMA NI PROPESOR TUKO was planned during that time. However, this production never happened. Consequently, DAE stopped after year 2001. After eight succeeding years without the theatre in the campus, Engr. Aleksandre Pates, one of the alumni of Basic Education Department, and mentee of Mr. Pelayo during DAE (1999-2001), came back last 2008 after he finished his Bachelor’s Degree in Electronics Communication Engineering, and he got his licensed. Thus, DULAANG LA SALLE ARANETA ENSEMBLE (DLSAE) was born. At first, it was a really big challenge for Engr. Pates to reestablish DLSAE since it has been out for quite some time. Also, last 2008, there was a huge difference in the administration because De La Salle System completely took the management of the school. However, after series of debate and project proposals, DLSAE was given another chance to prove themselves on stage. The 1st Theatre Season Production (2008-2009) of DLSAE is a back-to-back musical and drama stageplays of SI ATE BILANG PISO: ISANG MUSIKAL, and AMBON NG KRISTAL, and it was held at Rizal Hall. The 1st play in this production is the very first Musical Play of DLSAE. This production ran for 6 days, and has a total of 12 shows (2 shows per day). After the resounding success of the 1st Theatre Season, the 2nd Theatre Season Production (2009-2010) featuring the stageplays, TRABAHO SOLILOQUIES, and ANG SISTEMA NI PROPESOR TUKO immediately followed. It was also held at Rizal Hall which ran for 6 days, and has a total of 12 shows (2 shows per day). On the 3rd Theatre Season Production (2010-2011), DLSAE encountered in financing a back-to-back stageplay production. This led them to produce only one stageplay, entitled CAÑAO: ISANG SAYAW NG PAGSASALINGLAHI. This was also held at Rizal Hall which ran for 4 days, and has a total of 12 shows (3 shows per day). The following school year, DLSAE was able to produce their 2nd Original Musical Play entitled A IS E FOR LAILA. This is their very 1st English Musical Play which was part of their 4th Theatre Season Production (2011-2012). The shows were held at Osmeña Hall which ran for 5 days, and has a total of 10 shows (2 shows per day). Due to the changed in DLSAU Management, the school’s priority was changed and DLSAE stopped for a year. After two years, Engr. Pates produced DLSAE’s first ever studio version, the Official Sound Track of A IS E FOR LAILA on June 2014. It was also during this time that DLSAE’s model was changed from Project-Based into a Theatre Class-Based. Unlike the Project-Based model, Engr. Pates has created syllabi for DLSAE members to offer them a more formal training. These syllabi are for the following courses: BASIC THEATRE (THTRE101), ADVANCED THEATRE (THTRE102), MUSICAL THEATRE (THTRE103), DESIGN AND PRODUCTION (THTRE104), and SCENE STUDY AND ADVANCED ACTING STUDIES (THTRE105). DLSAE marked its 5th Theatre Season Production (2014-2015) that featured another back-to-back stageplays ONDOY: ANG BUHAY SA BUBONG, and MOSES,MOSES. This was held back at Rizal Hall which ran for 7 days, and has a total 13 shows (2 shows per regular day including 1 gala show). Since DLSAE has shifted to a Theatre Class-Based, another major event was created to their list; the RECITAL PLAY FESTIVALS. In this event, the key players (director, stage manager, production design/assistants, and actors) of the production are the DLSAE Senior Core Members, Junior Core Members, and the New Members themselves. The 1st Recital Play Festival (2015-2016) was held successfully at the Performing Arts Hall, and it featured six different One-Act Plays namely SINO SI AKO?, MAY ISANG SUNDALO, WALANG IWANAN, TINGNAN NATIN ANG MUKHA NIYA, OVER A CUP OF COFFEE, and EYEBALL. This production ran for 3 days, and has a total of 6 shows (2 shows per day). For the 6th Theatre Season Production (2016-2017), DLSAE featured another back-to back stageplays entitled UNANG DALAW, and TATLONG UNGAS. This production was also part of the Cultural Arts Festival 2016. It was held at Performing Arts Hall, and it ran for 2 days which has a total of 4 shows (2 shows per day). DLSAE declared their first batch of BASIC THEATRE COURSE (THTRE101) graduates during their Christmas Party 2016 celebration. This includes the following students: Jowi Jireh Cruz, Shane Domingo, Victor Angelo Fuentebella, Marinelle Ortiz Luis, and Arjay Valiente. After a school year, the 2nd Recital Play Festival (2016-2017) was held successfully at the Performing Arts Hall. However, as compared from last year’s 6 stageplays, this production only featured 2 stageplays, namely JOHN… (ANG UNANG REGLA NI JOHN), and DOC RESURECCION: GAGAMUTIN ANG BAYAN. This production ran for 3 days, and has a total of 6 shows (2 shows per day). Currently, they are preparing for their 7th Theatre Season Production (2017-2018) featuring the stageplay, TWENTY QUESTIONS. As of June 2017, DLSAE was able to produce and presented a total 23 stageplays. Engr. Pates is the current Artistic/Creative Director since 2008. I have a friend who is a left-handed person. This means that he uses his left hand most of the time: from writing, holding the spoon and fork, and handing over anything to other person. Sometimes, since there is only a few specially desk for left-handed person in the room, he is forced to use the desk for right-handed person. I wonder what he feels about it so I asked him. He said, it is really tiring to use a desk not fit for him because his arms get easily tired, and sometimes, he bumps into other person’s arm while writing. According to research, left-handed person is inclined more in holistic thinking mode. Which means that using the right hemisphere of their brain, they have an advantage in controling their musical, artistic, creativity, perceptional, and emotional aspects. In short, they can become exceptional artists, and musicians. But how can they improve such talents if let’s say most of the musical instruments available in the market are only for right-handed person? Isn’t this a hindrance for them? It’s a good thing that nowadays, musical instrument companies consider a niche for left-handed people. If you are looking for extraordinary musical instrument like left handed acoustic guitar, check it out at GuitarCenter. One day, when we were together on our way home, I asked him if he plays an acoustic guitar, then he asked me back the same question. I told him that I know how to strum some of the songs, and I’m still learning how to master it. When I asked him the same question again, he said that his father taught him how to play guitar but he didn’t pursue it because the guitar that they were using is designed for right-handed person. This may be a limitation for him before but not anymore! Hello readers! I apologize for not updating this blogsite for quite sometime because yours truly is simultaneously pre-occupied with so much things (Yes, I’m guilty! My bad!). I, myself, am wondering how I could squeeze them all up in less than 24 hours. I believe that it’s because of the unselfish strength and grace that our Supreme being has given to me. Anyway, fresh from last Holy Wednesday, I was able to have my Visita Iglesia for this year. I just took the opportunity of being half day in the office after our sumptuous lunch with our Project Director and our VP. The churches that I have chosen to visit are located in different parts of Metro Manila. They are not just rich in history but indeed the places worth visiting as well. From Greenbelt 3, Makati, I started travelling at around 3:30PM. I rode the MRT 3 Train from Ayala Station going to Taft Avenue Station. At this moment, I noticed that as compared with the South Bound platform, there were more people going to the opposite bound (North Avenue). I believe, most of them left their offices early to catch up their respective trips going to provinces to spend Holy week with their families. After I reached Taft Avenue Station, I walked towards LRT 1 EDSA Station. Thank you for the BEEP card because we are only keeping one card across LRT 1 & 2, and MRT 3 (And even for P2P Buses, and E-Jeepneys in Katipunan). From Baclaran Station, it took me around 10 to 15 minutes of walking towards the National Shrine of Our Mother of Perpetual Help which is the first Church I visited. As expected, there were plenty of people inside and outside the church. Some was having the station of the cross, others were just participating to whatever activity that the church has to offer. It’s almost 5:00PM when I finished my prayers. “Some call them love locks, others call them faith locks.” Just outside Baclaran Church, a grotto where fence with padlocks can be found, another way for people to display and declare their undying love, with God as their witness. Malate Catholic Church (a.k.a. as Nuestra Señora de los Remedios) was the second church that I visited. From Baclaran Church, I returned to LRT 1 Baclaran Station, and I searched for the LRT 1 station where this church is nearby. I went down to Quirino Station, and after another 10 to 15-minute walk, I was able to find Malate Church. When I arrived there, I saw a group of people currently having their Station of the Cross in Filipino language. As much as I would want to pray with them, I didn’t do it because they were almost done. I just had the Station of the Cross alone. At first, it was a challenge for me because they were praying in chorus using a PA system but I focused instead to cope with it. Malate Church can be found in front of the Manila Bay in Roxas Boulevard and surrounded by some tall buildings. I accidentally went to this church because San Sebastian Church was supposedly the third church in my list. From Malate Church, I rode a Jeepney going to Quiapo, and I went down to Manila City Hall. Just a few walk, you can see another set of Jeepneys (alongside SM Manila) that says “Legarda / San Miguel / San Sebastian.” However, at first I wasn’t able to ride this because I took the Jeepney that I saw in front of the mall which I thought has the same route. I even asked the barker if the route was going to R. Hidalgo Street, he paused for a second, and confirmed. However, on our way, I noticed that it’s taking a different route so I instead ended up visiting Saint Vincent De Paul Parish located beside Adamson University, it was passed 6 o’clock in the evening then. The church was still open but aside from me, only two more people were praying inside, and it was really quiet. I was only hearing myself while praying, including the cars that passed by outside. Located at the back of Saint Vincent De Paul Parish is the famous photobomber building, Torre de Manila. It doesn’t only messed up Rizal Monument view in Luneta but even this parish. At last, the fourth church I visited, the San Sebastian Church. From Saint Vincent De Paul Parish, I walked along San Marcelino going to the side of SM Manila where the Jeepneys can be found. I arrived passed 7 o’clock in the evening. The Stations of the Cross were located at the parking area of the church in front as well of the Saint Rita College. While praying, I can still feel the humidity of the summer breeze even if its already evening, but it’s much better than the afternoon scorching heat of the Sun. San Sebastian Church is known for its Gothic architectural feature. It is the only all-steel temple in the Philippines, and the only prefabricated steel church in the world. The fifth church that I visited is canonically known as Saint John the Baptist Parish but it is famously known as Quiapo Church. From San Sebastian Church, one can go to Quiapo Church by passing through R. Hidalgo Street going to Quezon Boulevard, then taking the underpass. Some of the landmarks includes Nazarene Catholic School, and Manuel L. Quezon University. While walking, I passed along one of the oldest bakeshop in Manila, the Bakerite which was erected since 1946. I bought breads and pastries for take home because we’ll eat these for our fasting. Unlike the previous churches that I visited, Quiapo Church is a very busy temple. When I arrived there, a Lenten Play (Cenaculo) was currently being shown outside the church, and it was being projected on the big screens inside the church. One can easily get distracted from these but if you only concentrate on the purpose of Station of the Cross, you can get use to it. The Agony in the Garden scene. The Lenten Play (Cenaculo) was presented live in front of the Quiapo Church in the evening of Holy Wednesday. Located just a few steps away from Quiapo Church was the sixth church that I visited, the Santa Cruz Church. It was built when the arrabal (suburb) of Santa Cruz was established by the Jesuits in the early 17th century. Around 8:30PM, and while having the Station of the Cross, a group of cyclists dropped by in front of the church, and said a prayer silently. They took a group photo with the church as their background. I don’t know but may be, it’s their way of Visita Iglesia: losing weight, and reflecting at the same time. While praying, this lovable cat which looks like my adopted kitten, Pepita, stares at me. How cute is that! It was 9 o’clock in the evening when I arrived at San Agustin Church, the seventh church that I visited. This is a 446-year old church as of year 2017. Supposedly, I was planning to visit Minor Basilica and Metropolitan Cathedral of the Immaculate Conception (a.k.a Manila Cathedral Church), to conclude this year’s Visita Iglesia but they were already closed. Thank God, San Agustin Church was still open. Just like the previous churches that I visited, their Stations of the Cross were placed outside the church. This is to accommodate more Catholics during the day. I finished my Visita Iglesia at around 10 o’clock in the evening. Before I went home, I bought some instant noodles at 7-11 beside Manila Cathedral for our fasting until Black Saturday. I don’t own a car. I know most of you are thinking that it is very difficult for someone to do Visita Iglesia. But isn’t that the essence of the activity? Our own sacrifice to feel the Station of the Cross journey even if these sacrifices aren’t even closer enough to what Jesus Christ have actually experienced. For me, I believe that the more hardships we experience, the more it is effective as a member of the Catholic Church. Of course there are exemptions for believers who have serious medical conditions, senior citizen, have small kids, etc., and most likely, they can do this activity in their own comfortable way depending on one’s faith and devotion. You still have time until Good Friday to participate in the Station of the Cross. Station of the Cross Prayer Book. This is the very first thing that you need to prepare since it will serve as your guide in your journey. Although, there are some of the churches which provide or post the Station of the Cross guide, it is better that you keep one to yourself. In my case, what I have been using in the past 2 years is a Smart Phone App. You can download the app, Stations, if you are using an Apple phone or gadget. A Bottle of Water. To survive the scorching heat of the Sun, and to keep yourself hydrated, you can bring with you a bottle of water. This will replenish the liquid that you lose during the course of your journey. An Extra Shirt and Towel. In the Philippines, since Holy Week falls on the Summer Season, it is expected that you will sweat more so it’s better to bring with you an extra shirt and/or towel that you can use. Extra Money. It is advisable that you bring extra money to be used not only for the fares from one church going to the other, but also to buy extra bottle of water or bread. Your Presence. Not just physically but also mentally. This is one of the most important aspects that you need to have when you participate in Visita Iglesia to experience it wholly and Holy. The organizers and volunteers of the 2nd Medical and Dental Mission. Another chance of giving back… The De La Salle Araneta University Alumni Association, Inc. (DLSAUAA) has successfully conducted and spearheaded the 2nd Medical and Dental Mission held at DLSAU, Institutional Activity Center, June 11. There were a total of ten medical and dental doctors namely Dr. Edwin De Guzman, Dr. Jean. Ladaban, Dr. Remedios Sutiangso, Dr. Buena Hebron, Dr. Emily Bonalos, Dr. Geraldine Rodriguez, Dr. Rialyn Lapera, Dr. Blossom Bosch, Dr. Shiela May Nidua, and Dr. Ronald Florentino who attended to almost 250 patients in which 200 of them were medical consultation while the other 50 were dental check-ups or tooth extraction. Aside from the free medical and dental services, patients were also provided with vitamins, supplements, medicines, and oral hygiene kits. When I was in highschool, my sister gave me a sterling silver ring as a reward for doing well in school. I considered it as one of the greatest gift of all time because it reminded me of my sacrifices and hardwork. Thus I perceived this as my highschool ring. For everyone, ring is just a piece of jewelry that you can showcase in public as a sign of luxury. However, if you notice, there is a significant meaning behind it as it symbolizes more than just piece of metal. Let’s say if someone proposes a marriage to his or her partner, then that ring becomes an engagement ring, which will signify their promises of love wherein they just need to wait for the very special moment of their union. On this special day, another set of rings are being exchanged with the couple. A glamorous set of wedding rings which is somehow similar to the Reeds for wedding ring sets that symbolizes their unity in life, is yet another momentous thing that they could ever receive. This was my Opening Remarks to the 12th ECE Student Summit held at SM Manila – Cinema 4, February 27. Good morning dear classmates! When I’m surrounded by many students I feel like I’m still one of them, isa lang ang ibig sabihin niyan, that a person like me still need to learn many things, indeed learning is a continuous process. Pero sabi nga nila na hindi lahat ng pinag-aaralan sa apat na sulok ng sild-aralan ay kailangan ng isang tao para mag-survive. Naniniwala ba kayo d’un? Ako naniniwala ako kasi sa anim na taon kong pagta-trabaho sa industriya, halos lahat ng pinag-aralan ko sa eskwela, hindi ko naman talaga nagamit. Ang usapan na kapag naghahanap ka ng trabaho ay hindi lang puro talino, kailangan mo din ng diskarte at abilidad. Isang requirement lang naman ang Transcript sa pag-aapply ng trabaho. Magagamit mo naman ang pinagaralan mo talaga lalo na kapag may mga exam sa aaplayan mo. Siyempre, kung maganda na ang transcript mo, tapos maabilidad ka na at marunong ka pang dumiskarte, tiyak na makakakuha ka ng magandang trabaho. Sigurado ako na ang iba sa inyo, kapag nakatapos na ng pagaaral at nakapasa ng board, ay makakakuha ng trabahong hindi gaanong angkop sa propesyon natin. Pero kanya-kanyang trip lang ‘yan eh. Kanya-kanyang diskarte ‘yan. ‘Wag ka mawawalan ng pag-asa, kung nalihis ka man pansamantala ay tiyak kong magagamit mo ‘yung karanasang iyong natamo para bumalik ulit sa ating propesyon. At sinisigurado kong mas angat ka pa sa mga makakasabayan mo sa karera. So naniniwala pa ba kayo na hindi lahat ng itinuturo sa loob ng classroom ay hindi mahalaga? Siguro oo. Pero lahat ng karanasang iyon ay makakatulong ng malaki at kung iisipin mo na kung sa mga mumunting pagsubok na ‘yun, sa mga pag-aaral at pagsusulit na ginagawa mo ay hindi mo pa magawa ng tama, paano ka pa haharap sa hamon ng buhay? Sa tingin mo kakayanin mo bang panindigan ang pagiging isang Inhinyero? Dapat kasi kapag nag-aaral ka, hindi mo isinasa-utak, dapat ay isinasa-puso mo. Parang pagmamahal, para mahirap mo itong makalimutan.